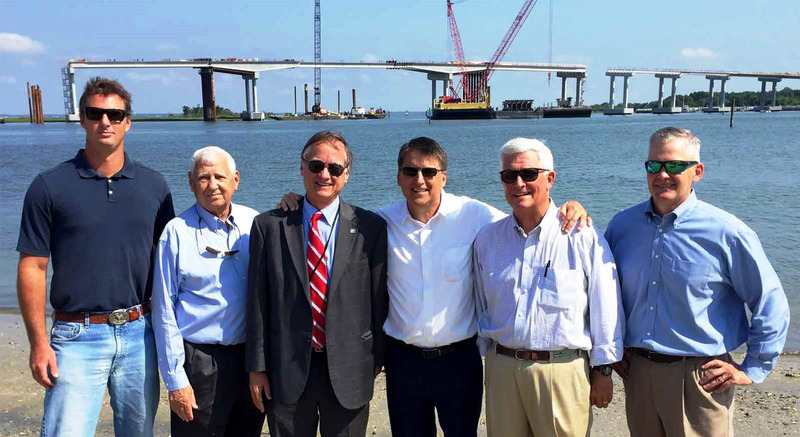 North Carolina Governor, Pat McCory, and Brigadier General David Turner, commander of the United States Army Corps of Engineers, visited Conti’s Gallants Channel Bridge (also known as the Radio Island Bridge) project today. The purpose of the visit was to survey the progress of the project, which is anticipated for completion in early 2017, much sooner than the original completion date of mid-2018. Conti was contracted by the North Carolina Department of Transportation to begin constructing the new multi-lane bridge over the Gallants Channel in March 2014. At project completion, the team will have built the bridge, a new US 70 highway crossing Route 110 and a tie-in to the existing US 70 roadway. Along with providing much needed relief to traffic congestion in Beaufort County, these new transportation channels will serve as an economic driver for North Carolina.